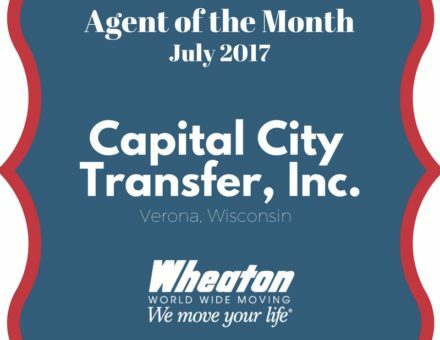 VERONA, WI – Capital City Transfer, Inc., Verona, Wis., is Wheaton’s Agent of the Month for July 2017. Capital City became a Wheaton agent in 2009 and has since earned numerous sales, hauling and quality awards. This is their fifth Agent of the Month award. For more than 45 years, the movers at Capital City Transfer, Inc. have lived up to Wheaton’s “customer first” philosophy while serving and satisfying customers throughout the state of Wisconsin. Their professional staff of account managers, packers, loaders, warehouse specialists and expert drivers all have extensive moving industry experience in both residential and corporate relocation. Some of Wisconsin’s largest employers are counted among Capital City Transfer’s corporate customer base.